As I reversed out of my driveway at 6:30am Monday morning, I never would have imagined how much I would experience in the 16 hours before pulling back into my driveway that night. I have been asked to assist Pastor Loren Pratt for the rest of 2013 as he has ridiculous load on his leadership plate. I jumped at the chance to work with Loren as he is a longtime friend and hero of mine. 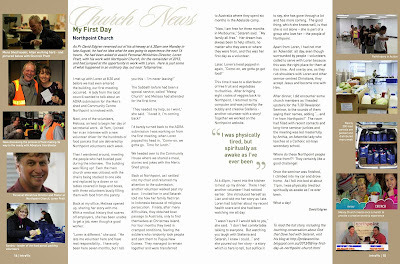 I arrived at Northpoint at 8am and studied my Sabbath School lesson until meeting Loren at 8:30. Before we even entered the building our first meeting occurred. A lady from the local council showed up to talk to Loren about an ADRA submission for the Men’s Shed which meets at Northpoint in the upstairs woodworking room and at the local council centre for meals. After the meeting, Loren emailed me the submission to complete. Next Melissa, one of the volunteers, arrived to begin her day of secretarial work. At 9am, I joined Melissa in an interview with a new volunteer driver for the hundreds of food parcels that are delivered by Northpoint volunteers each week. After the interview, I wandered around to meet the people who had bustled past during the interview. The building was filling up! In the main church area, the chairs were stacked on one wall and a dozen or so tables were covered with bags and boxes which three people were busily packing with food from the pantry. I introduced myself to Sandra, the volunteer food packing coordinator. I walked back to my office to look over the ADRA submission and bumped into Allan, the Men’s Shed coordinator. Yes, he’s a volunteer, too. I’d barely turned back to my ADRA submission when Loren popped his head in and said, “Come-on, we gotta go. Time for lunch.” We headed over to the community house where we shared a meal, stories and jokes with the Men’s Shed group. An hour later we were back at Northpoint. As I settled into my chair and turned my attention back to the submission, one of the food packing volunteers walked past my door. I said, “Hello, come in and tell me your story.” I had no idea! Setareh (her name means star, in Persian) told me about the past year of her life. She fled Iran with her family due to religious persecution. “My father have a problem,” she said. They were afraid for their lives and fled to Indonesia and paid for four places on a boat to Australia. The man they paid took their money and never came back. After months in Indonesia, Setareh’s father was able to gather enough money for a second payment. This time they made it on a boat. "And now you're a volunteer helping people in Australia!" I said. "Yes," Setareh said. "It has always been my dream to help others, no matter who they are or where they are from." “How long have you been volunteering here?” I asked. “My first day!” she said. After hearing the story of Setareh’s journey, I asked her if she was Muslim. I smiled, wondering if God ever feels like each religion is another sentence he has to serve out! But, I knew what she meant. “Yes, pray! You will pray for me?” Setareh asked. As I prayed for Setareh, I thought of her open hands—and open heart—for prayer, and my closed hands to symbolise the same thing. I realised, she saw prayer as an act of receiving rather than requesting. Her hands in prayer were ready to receive all that our “One, All, Same” God has to offer. “So, that’s the rest of the story,” I said, as Loren drove down the freeway. After bringing eight crates of veggies back to Northpoint, I returned to my computer and was joined by the bubbly and creative Stefania - another volunteer with a story! Together we worked on the Northpoint website. At 6:45pm, when we finished editing, I went into the kitchen to heat up my dinner. In the kitchen I met another volunteer I had seen working in the secretarial office. She introduced herself as Lian and told me her story as I ate. Loren had told her about my recent health scare and she had been watching me all day. Then she poured out her story. It’s a story that is hers to tell, but suffice it to say, she has gone through a lot and has scary times coming up. The good thing, which she knows well, is that she wont be alone because she is part of a group of people at Northpoint who love her. After dinner, I headed upstairs for the 7:30 Revelation Seminar. 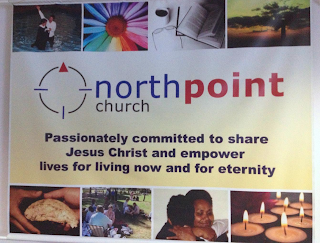 As I entered the room the first few people who were there shouted their names and “I’m from Northpoint.” I realised these were the first “Adventists” I had met all day. The rest were all volunteers called to serve with Loren because Northpoint is the right place for them at such a time as this. 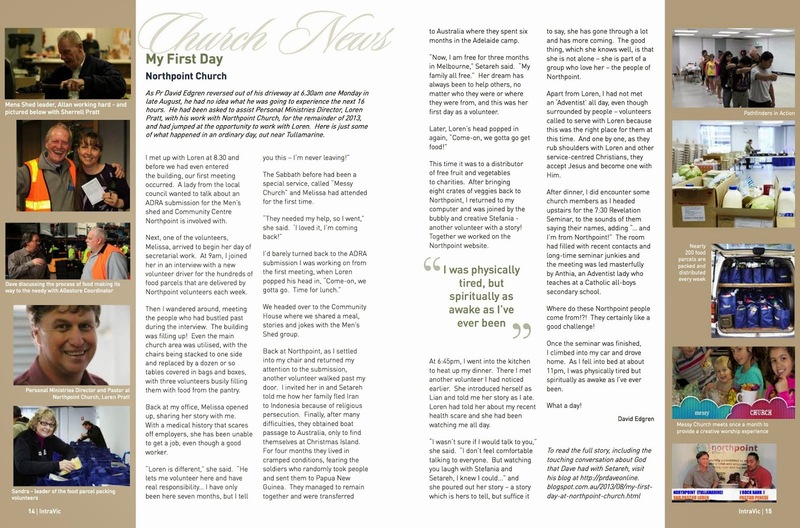 One by one, as they rub shoulders with Loren and the other service-centred Christians at Northpoint, they accept Jesus and become one with Him and His church. By the time we started the Revelation Seminar, the room had filled with recent contacts and longtime seminar junkies. There were about 20 people avidly studying the Word. The meeting was led masterfully by Anthia, an Adventist lady who teaches at a Catholic all-boys secondary school. Where do these Northpoint people come from!?! They like a good challenge! Once the seminar was finished, I climbed into my car and drove home. As I fell into bed at about 11pm, I was physically tired but spiritually as awake as I’ve ever been.